New orders for factory goods fell in April for the third time in four months as demand slipped for everything from cars and machinery to computers, the latest worrisome sign for the economic recovery. 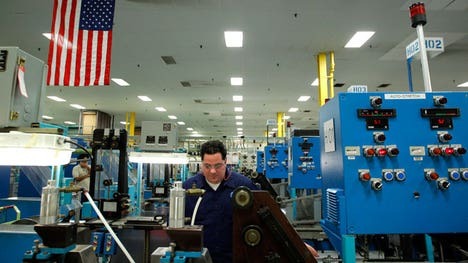 The Commerce Department said on Monday orders for manufactured goods dropped 0.6 percent during the month. The government also revised its estimate for new orders in March to show a steeper decline. Economists had forecast orders rising 0.2 percent in April. The report showed broad weakness in a sector that has carried the economic recovery, adding to a growing body of soft economic data. The Labor Department on Friday reported that job creation slowed in May for the fourth straight month. Also that day, the Institute for Supply Management said the pace of growth in manufacturing slowed modestly in May, although the ISM's own gauge of new orders rose to its highest in over a year. The Commerce Department report showed new orders for motor vehicles and parts fell 0.5 percent in April. An increase in new orders for civilian aircraft buoyed the overall transportation sector. Outside transportation, orders dropped 1.1 percent, with machinery down 2.9 percent and orders for computers and electronics off by 0.8 percent. Orders for non-defense capital goods excluding aircraft - seen as a measure of business confidence and spending plans - dipped 2.1 percent in April.